Wednesday, January 25, 2017: This morning, we reluctantly leave the home of Dewey and Bea, but not before a nice breakfast courtesy of our accommodating hosts these past twelve days. It’s been a great visit but Kit and I need to move on and continue our trek toward the left coast. 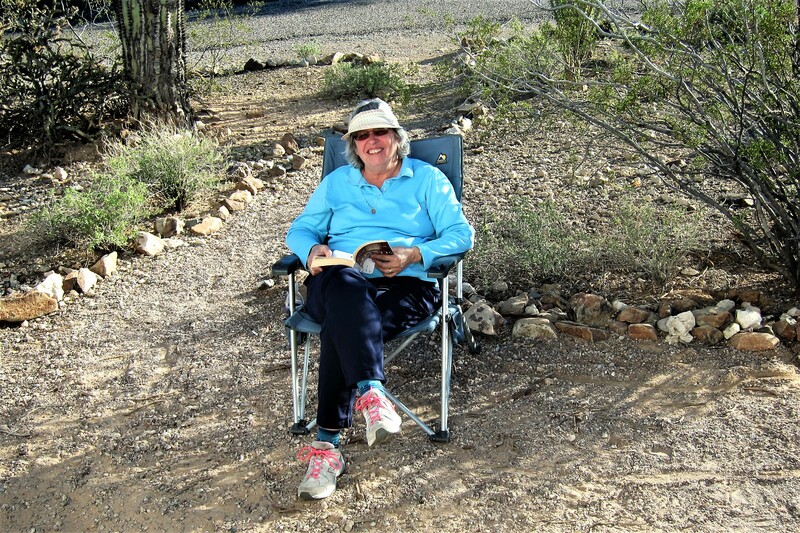 Besides, Bea’s sister and her partner are coming into town for the Tucson Gem and Mineral show so we wanted to give our host a few day’s relief before the next camping couple arrived. Departed at 1108 hours under sunny skies and a temperature of 67 degrees. 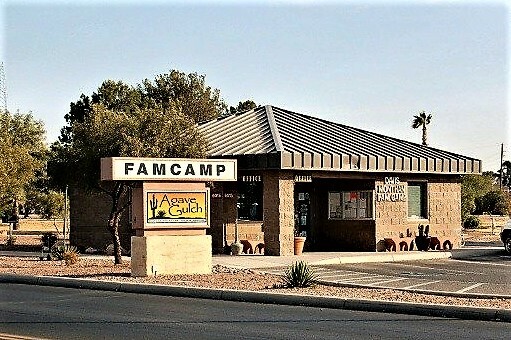 A half hour later found us pulling into Davis-Monthan Air Force Base and checking into the Agave Gulch RV Park. This stop has become traditional for us as it creates a bit of down time to take care of chores that would otherwise be difficult given our rather nomadic lifestyle. Every 60 days or so, I like to flush out the grey and black water waste tanks, and sanitize the fresh water tank. In addition, we thoroughly clean and vacuum the interior then clean and lubricate all suspension components, hitch system, and leveling jacks. Besides it is an excellent opportunity to resupply and get caught up on correspondence and family business items due to the campgrounds robust and free Wi-Fi. All these chores and more will be attended to over the next few days. But for this evening, after a walk about the park, we settled in for a nice meal and some Wine-Time before retiring. 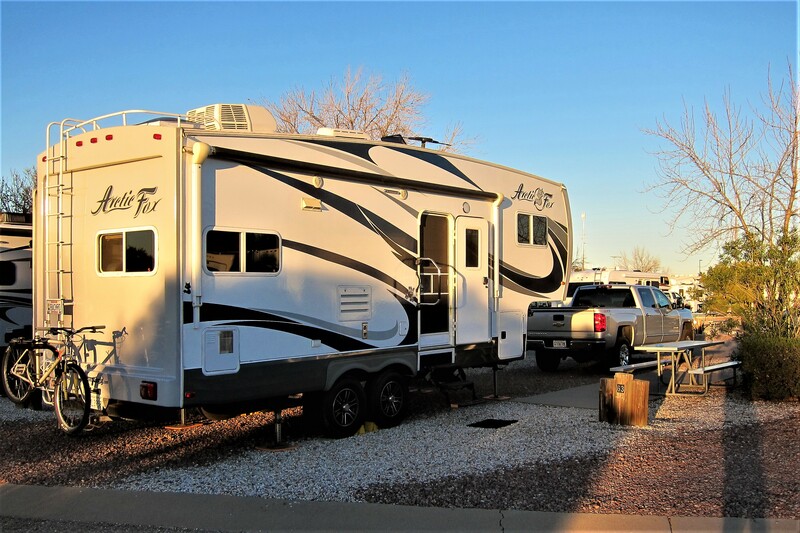 Thursday, January 26 through Monday, January 30, 2017-Agave Gulch, DMAFB, Arizona: Kit and I originally had no plans to stay at this military RV Park more than a few days…but when the opportunity came for us to move from the dry camping overflow area to a nice full hookup site we jumped at the chance, and began extending our stay on a day by day basis. Desert Eagle has one of the fairest rotation policies in the military campground system…first come, first serve, then after 21 days you rotate to overflow and give someone else a chance for full hookup. Normally we stay in overflow one day, but with the Gem and Mineral show in town, we stayed a little longer…however, in three days we were able to rotate to this site. So, what did Kit and I do during our stay? Well, in addition to the previously mentioned items, we did a pile of laundry, washed the truck, got caught up on journal writing, took care of online banking and investment business, and other routine chores of the road that I seldom mention in these journals. For some reason, this park attracts some of the friendliness folks around. Kit and I met some very nice people from Idaho, Arizona, North Carolina, Washington, and Saint Agathe, Maine! Had a great time visiting, getting to know each other, and sharing our various RV travel adventures. During the stay, a local RV dealer put on a barbeque and mini RV show in the park. We met some of our new friends and enjoyed grilled chicken, potato salad, desert and drinks before walking through the newest trailers and motorhomes on display. This exposure piqued our interest and the following day we paid Lazy Day’s RV a visit to peruse these beauties. 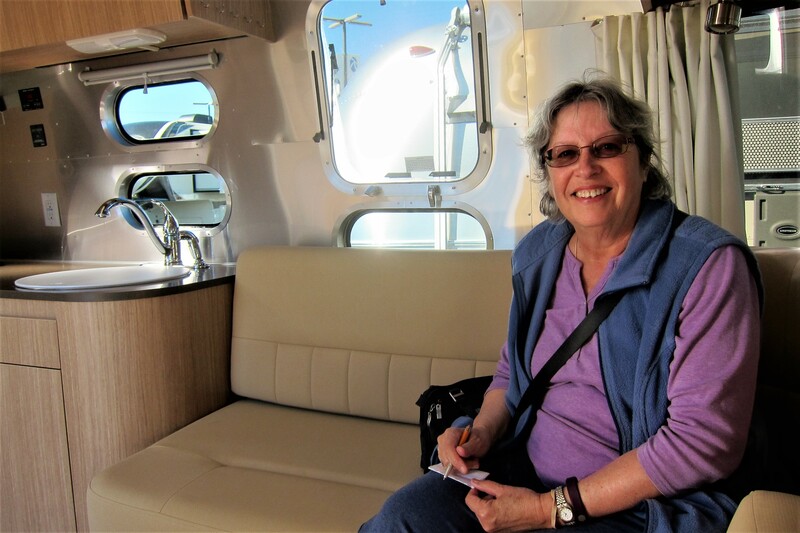 About ten years ago, shortly before retiring and while in the planning stages of our dream RV adventure, Kit and I strongly considered an Airstream brand travel trailer. These iconic and instantly recognizable campers have been continuously produced since 1936. 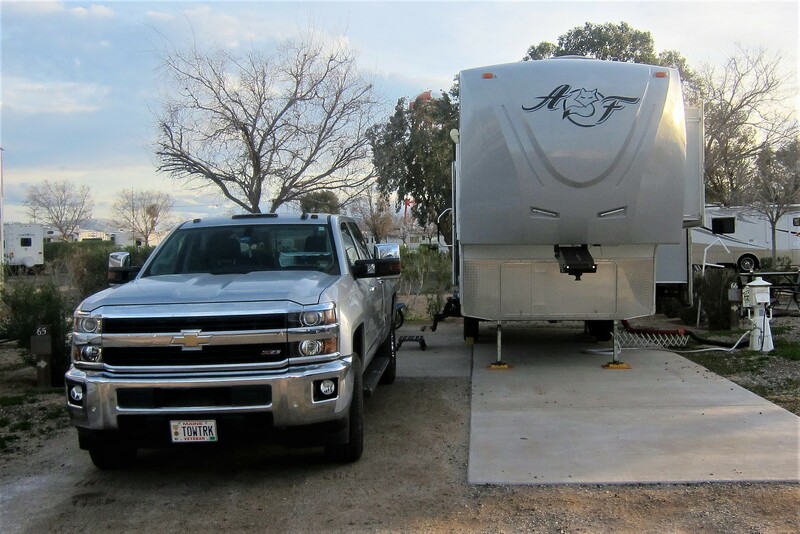 They are well built, efficiently laid out, light weight, easy to tow, and expensive…which was a deal breaker for us. Just couldn’t justify spending close to six figures for a camper we only intend to use for six months a year. I mean, come on…that would have been three times the cost of our first home! However, it’s still fun to visit the dealer, see the latest models and dream. 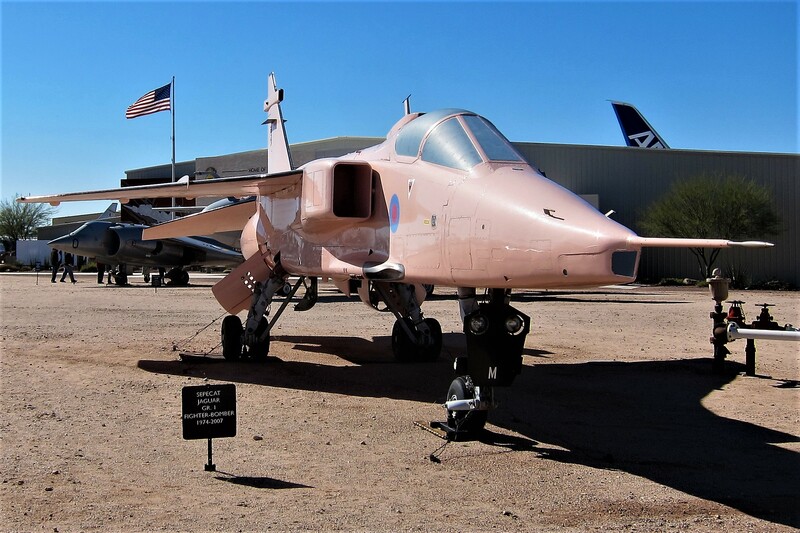 On another day, one that Kit badly needed some “Kit-Time”, I took the opportunity to visit the Pima County Air and Space Museum, which is located just to the south of the air force base. The campus covers 127 acres and houses 300 aircraft. In addition to all the standard historic aircraft that many museums feature, this place has some unique and one of a kind artifacts…such as the smallest propeller driven biplane ever flown. 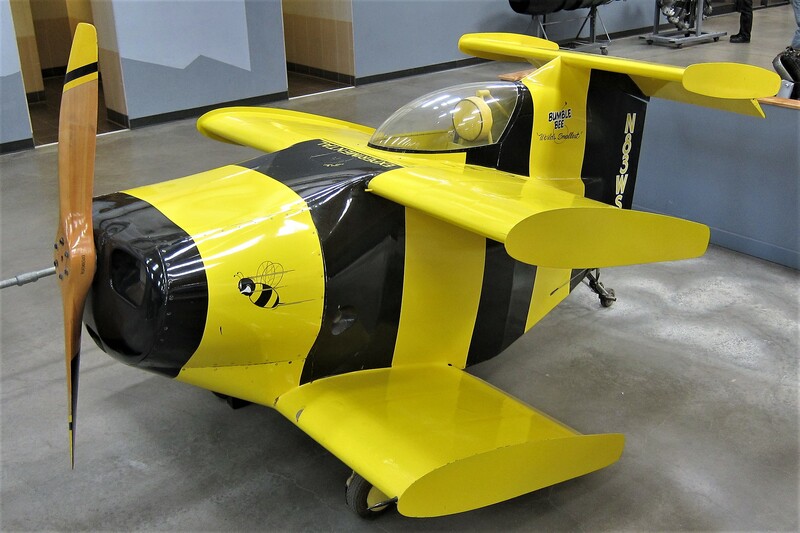 At 9 feet 4 inches long and with a wingspan of a minuscule 6 ½ feet, the 85 HP engine can propel this 725-pound aircraft to speeds of 180 MPH! It was built for one sole purpose…to break a world’s record, which it did in January of 1984…and the record is still standing! And then there is its cousin, the smallest jet ever successfully flown! At 12 feet 9 inches long and with a wingspan of 17 feet, the 200 thrust engine can propel this 860-pound jet to speeds of 320 MPH. 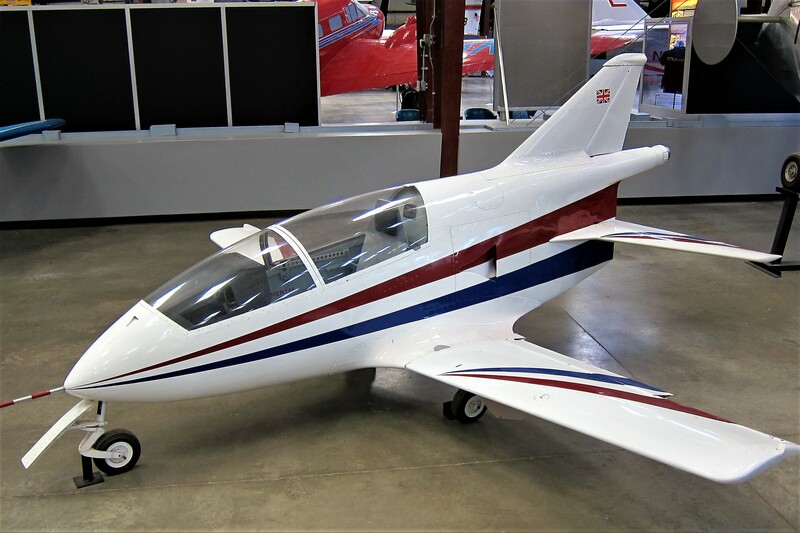 The aircraft was commercially offered in kit form but proved too difficult to control by anyone other than an extremely skilled pilot so very few were built. And on the other end of the spectrum, we have the largest paper airplane ever flown! Well, what’s left of it! 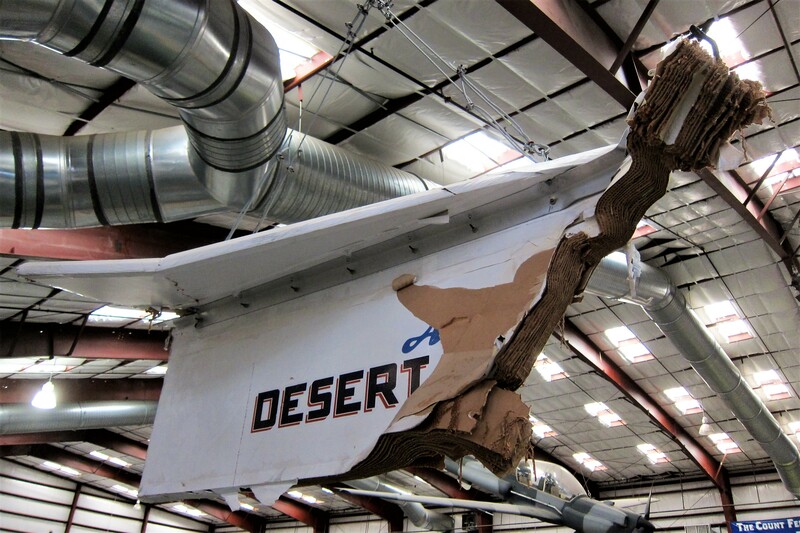 At 45 feet long and with a wingspan of 24 feet, the 800 pound glider reached a speed of 98 MPH for about 30 seconds, before disintegrating and crashing into the Arizona desert. The paper airplane was designed and built by a cadre of local high school students as an inducement to consider aeronautics for a career choice. 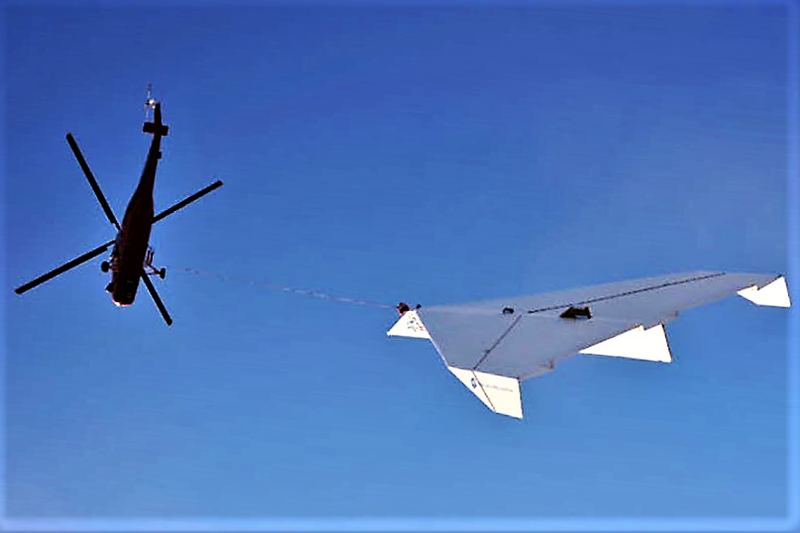 It was towed aloft by a helicopter to 2,700 feet before being released on its maiden and final flight. 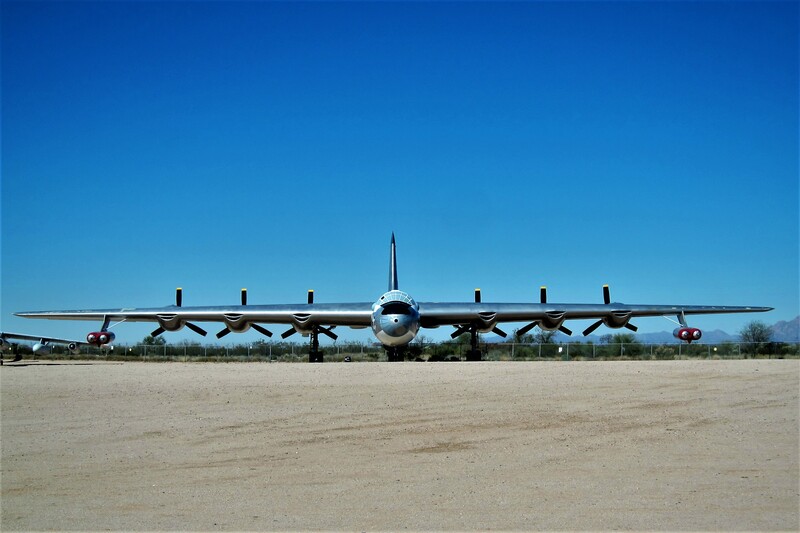 Then, there is the B-36 Bomber, a 10 engine (six piston engines and for jets) behemoth designed after WWII to carry the nations newly ultimate weapon…the nuclear bomb. The piston engine pusher-prop bomber was becoming obsolete as the planned 384 aircraft were being constructed by Convair Astronautics in 1948. Some were converted to surveillance aircraft and others continued to prepare and train for the anticipated nuclear war with Russia. The Bomber’s contribution to the military vernacular was sealed with the flight engineers report to the pilot concerning the operating status of the mixed power plants… “All engines turning and burning”. My fascination for weird and useless historical military hardware was further piqued by this pink jet fighter. However, as silly as it looks, this is a serious warbird! The Jaguar Fighter-Bomber was built by the French and is currently being flown by the Indian Air Force. Not the Native American Indians, but if so, that would add a whole different dynamic to the Standing Rock Reservations beef with the Dakota Access pipeline folks! These aircraft are flown by the country of India and the strange hue is an exact match to the color of the sand in the Arabian Gulf which makes it harder to detect when on the ground…in the air however, I bet it sticks out like a big pink sore thumb! There were three historic bombers in the collection from World War II. A B-17 Flying Fortress, B-24 Liberator, and a B-25 Mitchel. All have been restored to military specifications and remain on display to celebrate the workers that produced the bombers; as well as the crews that flew them. I thoroughly enjoyed the day spent at the museum…it is, in my opinion, the finest non-military museum in existence, and better than many military supported museums! 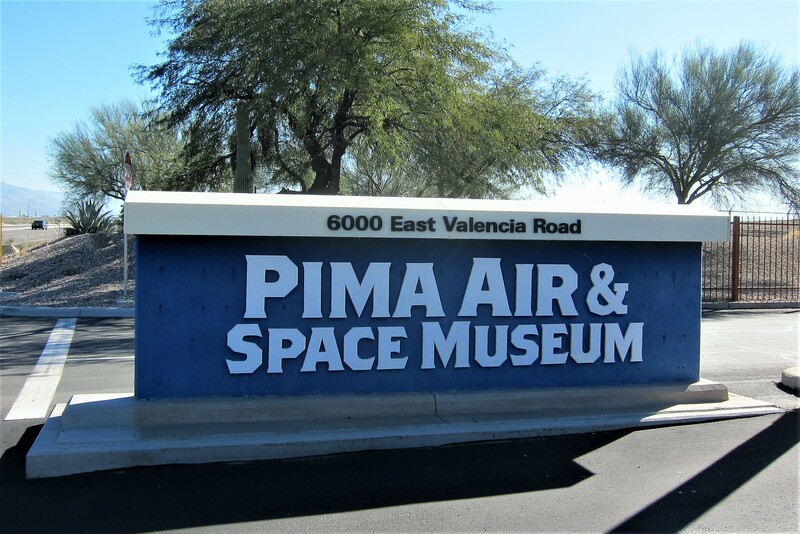 If in the Tucson area, treat yourself to a visit to the Pima Air and Space Museum! Another chore we accomplished was to research and purchase Kit a new laptop computer. 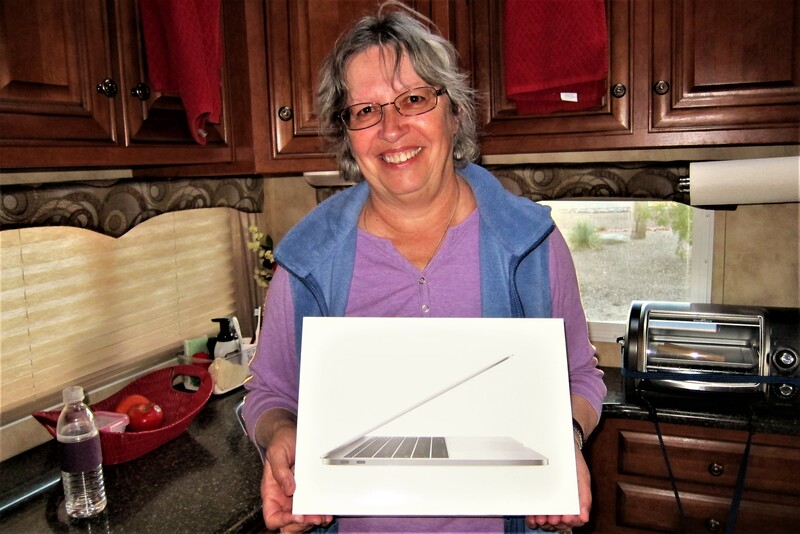 After years of struggling with an older Toshiba PC, Kit is now the proud owner of an Apple MacBook Pro! Note the ear-to-ear smile in the photo above! Well, even though Kit and I spent more time at Agave Gulch than originally anticipated, we did get a lot accomplished…and had a bit of fun as well! Tomorrow, we plan on pulling chocks and continuing our trek to the west. Tuesday, January 31, 2017: Underway at 1005 under sunny skies and temperatures in the 70-degree range. 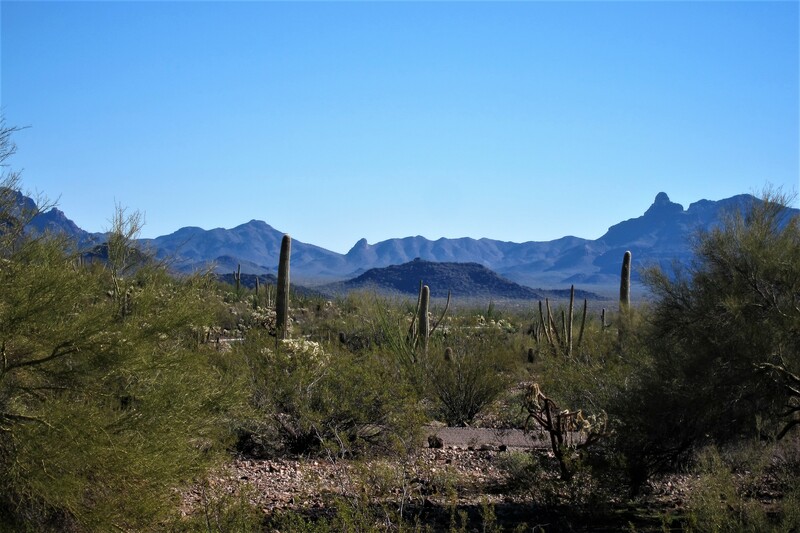 We hopped on the Ajo Highway heading southwest, then drove through the Tohono Odom Indian Reservation toward the tiny Arizona town of Why. Why? 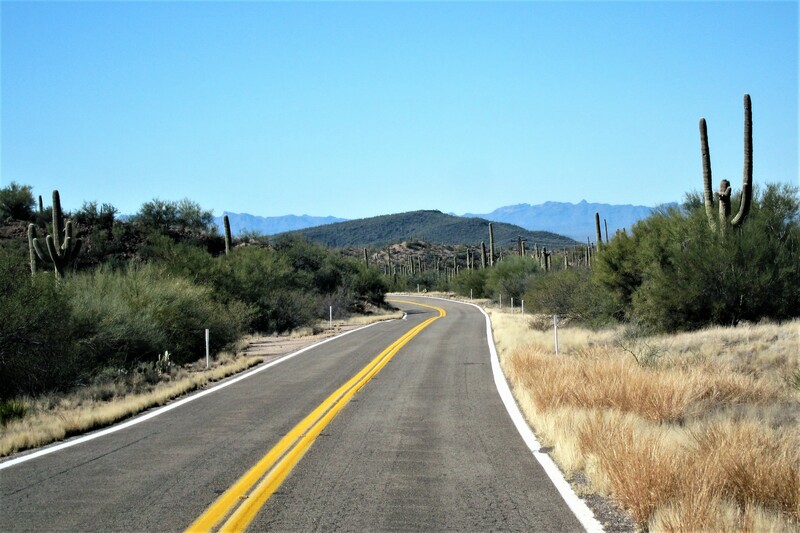 Well, that’s the only way to reach our new next destination, Organ Pipe Cactus National Monument! Where Kit and I scored one of the nicest camp spots in the park! We are positioned at the end of a row, which places the campers window laden left side toward the open desert…this is the view from our dining table. As the sun sets across the desert landscape, Kit and I are looking forward to a great couple of days in one of Americas great National Park units! 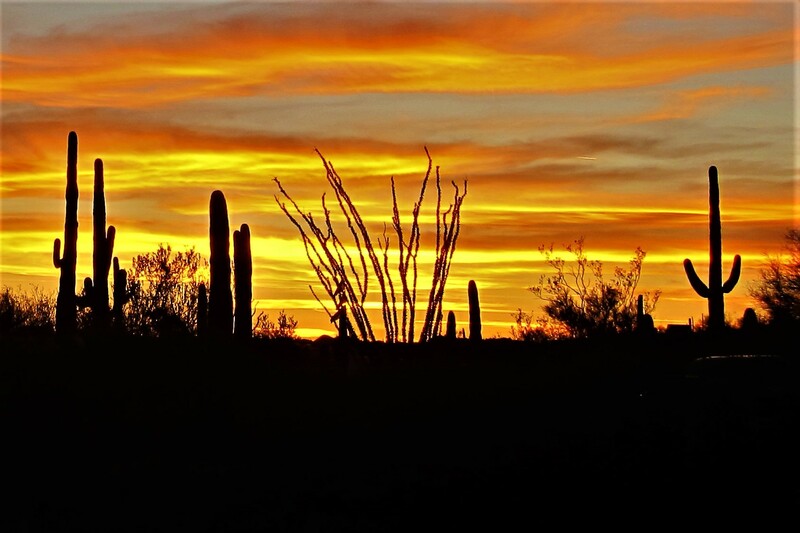 Wednesday, February 1 and Thursday, February 2, 2017-Organ Pipe National Monument: This morning, as I sat at the dining room table, the sun peeked over the Eastern horizon. Opening the window and sticking my camera out netted this interesting photo showing the sun reflecting off the dining room window. This is our second visit to this underutilized National Park facility…so we decided to leave the truck and trailer connected and just enjoy the peace and solitude of the winter time desert. 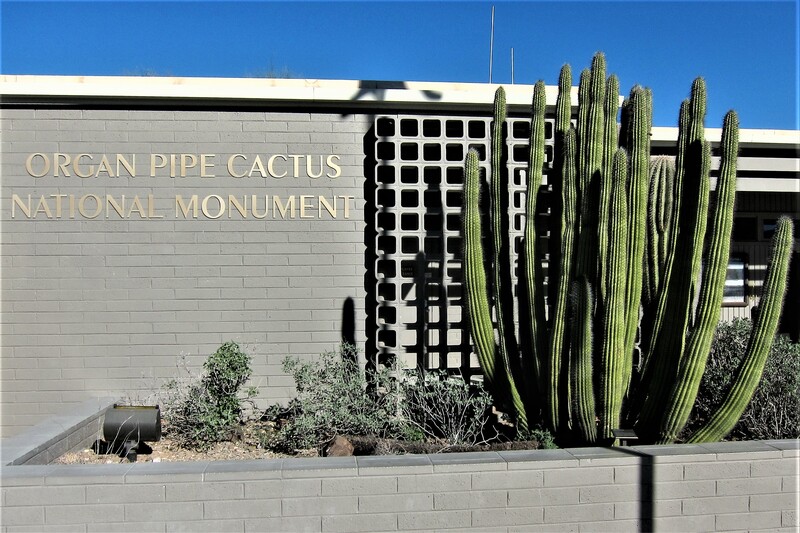 The cactus to the left in the photo above is an Organ Pipe Cactus. 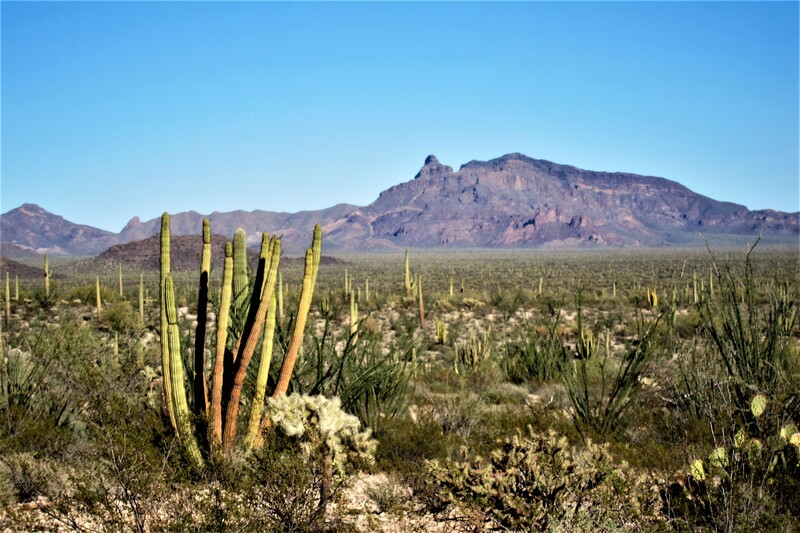 This region, hard up against the Mexican border, is the only place in the United States that the Organ Pipe Cactus naturally grows. 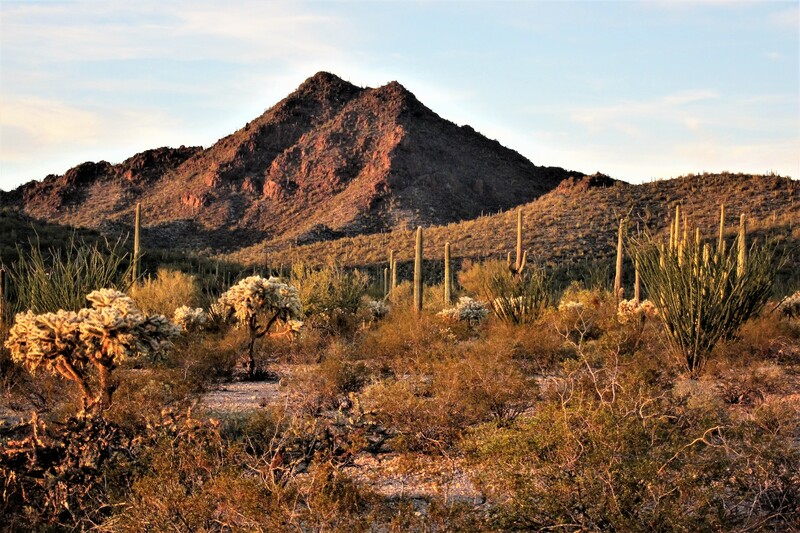 The park, which encompasses 517 square miles, is honored as a UNESCO Biosphere Reserve as it is one of the few remaining pristine tracks of the Sonoran Desert. The Mexican border is 5 miles to the south, and the nearest US town is 22 miles to the north, this and its ruggedness, makes the area prime for illegal entry. However, the US Border Patrol is everywhere and a visitors’ biggest safety concern is traffic accidents…not violence by folks crossing into the US illegally. Kit and I felt perfectly safe enjoying the hiking trails that spider web out from the campground into the open desert. At one point, we found our way to the visitor’s center, where we encountered this stout fellow. Yep this tiny Organ Pipe Cactus is all of 5 years old. But his nearby brother is at least 40 years old! 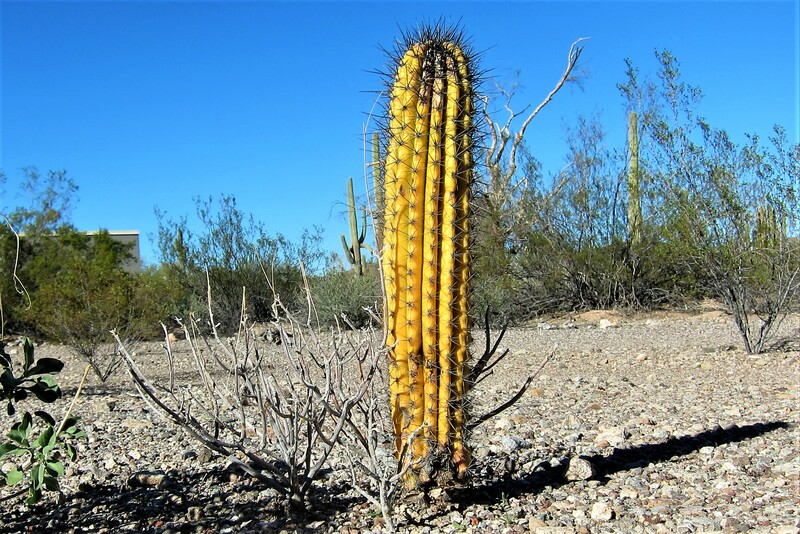 That too is deceiving, as its height is a mere 7 feet tall…yep cacti in the arid desert grow extremely slow! Most days, the Rangers assigned to OPCNM hold talks on the history, terrain, vegetation and animals of the park. Today, was a special talk by two agents from the US Border Patrol. We learned that the Border Patrol Service (BPS) is responsible for the area between the Points of Entry, better known as the border crossings, while the US Customs and Immigration (ICE) agents control the legal border crossing. An interesting factoid is that the 1,933 mile US/Mexican border has 9.3 Border Patrol agents patrolling per mile, while the 5,525 mile US/Canadian border, which is the world’s longest international border, only has 2.6 agents per mile. 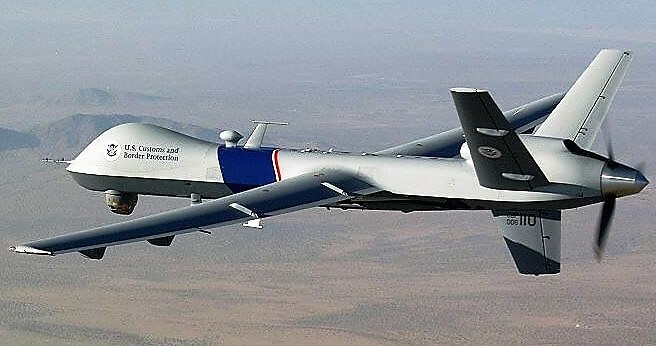 To augment protection, the border surveillance is enhanced by manned helicopter and remote control drone flights. 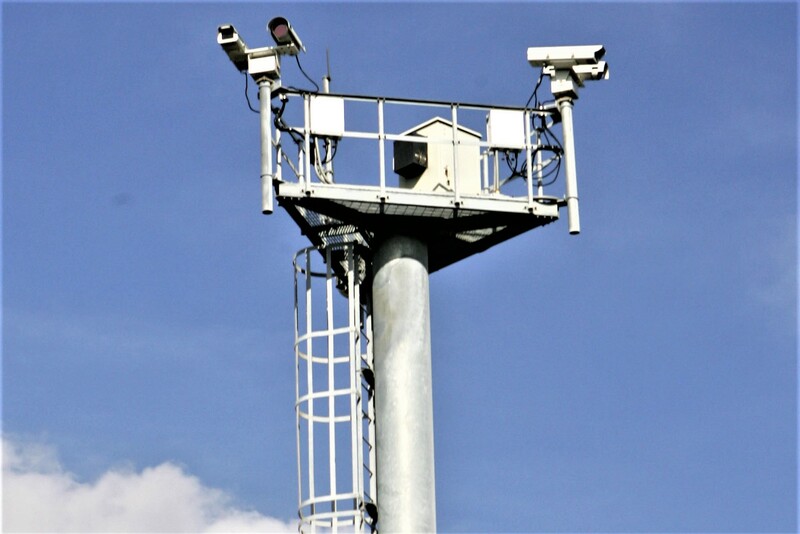 As well as monitoring towers bristling with cameras, infrared sensors, and ground vibration monitors. All folks that serve in the Department of Homeland Security deserve our respect and gratitude for their effort in trying to keep America a safe place to live…Thanks guys! Back at the campsite, Kit took the opportunity to get some reading in. While I sat the newest member of our traveling family out to enjoy the sunshine and hobnob with its brethren. Many RVer’s travel with pets, by the latest survey up to 70% of them do. As for us, we are far too nomadic to attempt that, at least not without some compromises. So, I purchased the above specimen as a substitute and ceremoniously presented it to Kit! 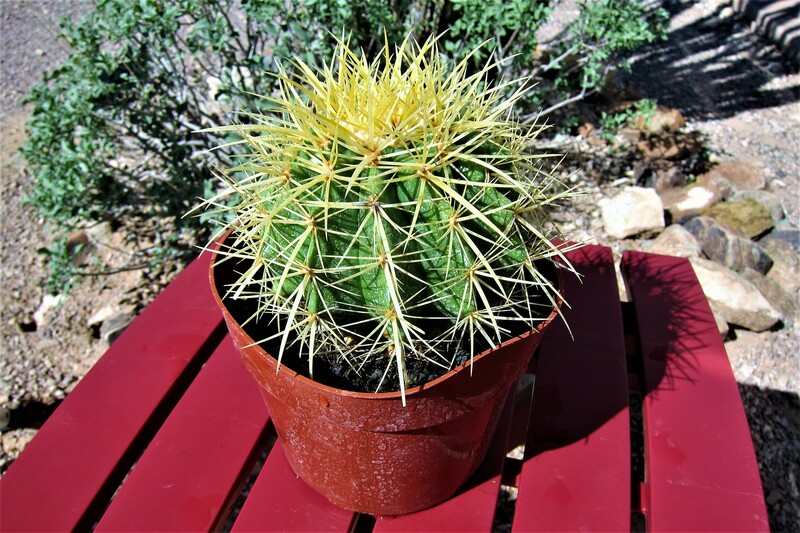 Traveling with a live cactus presents a thorny (pun intended) problem…how to care for the thing! Yea, I know…very carefully! Anyway, Kit was quasi delighted to receive the little fellow and was very happy the surprise gift wasn’t a live 18-inch Desert Tortoise! That was an incident that has gone down in Bill and Kit family lore…ask her to fill you in sometime! 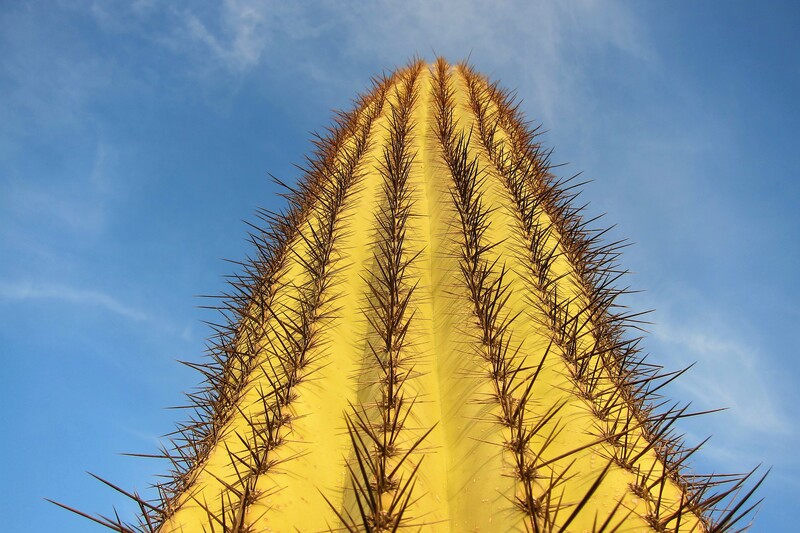 Pirating of cacti from public lands has grown into a big problem. So, a valid receipt is given the purchaser to prove the cactus was legitimately bought from a nursery. 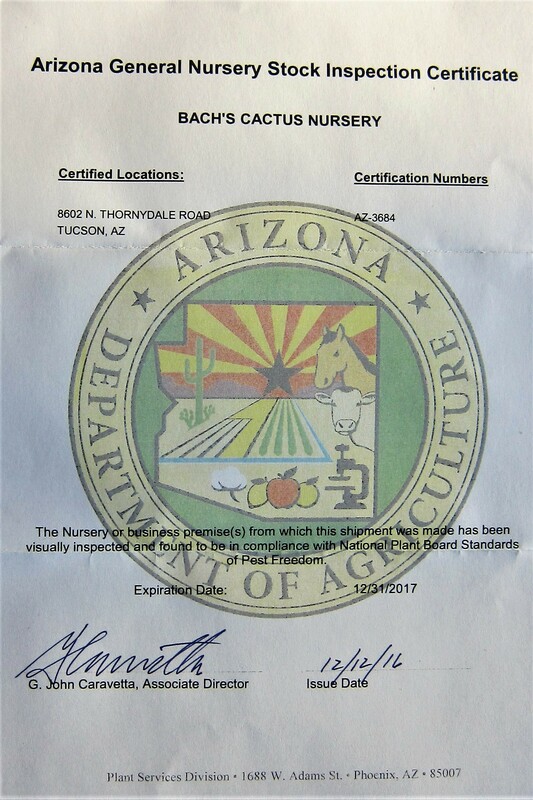 And if the cactus is going to travel beyond Arizona, an Agricultural Certificate is issued as well. Evenings around camp were spent watching the sunlight fade from the surrounding countryside which flooded the higher elevations in a rosy hue. Then as the sun dropped below the western horizon, the sky exploded with vibrant color. After which it became very, very dark and millions of stars sparkled in the cool desert sky. 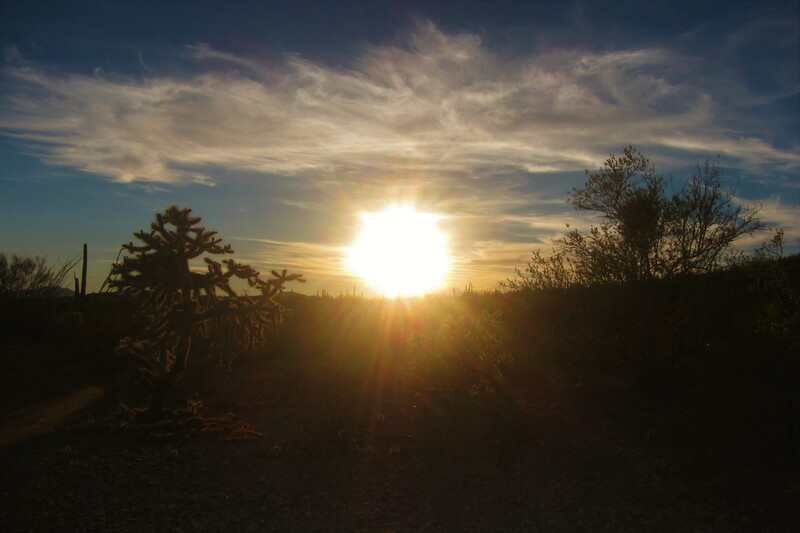 Goodnight from the Sonoran Desert! Friday, February 3, 2017: Up at 0630, coffee and breakfast, then on the road by 0900! Today we are continuing our trek toward the west. 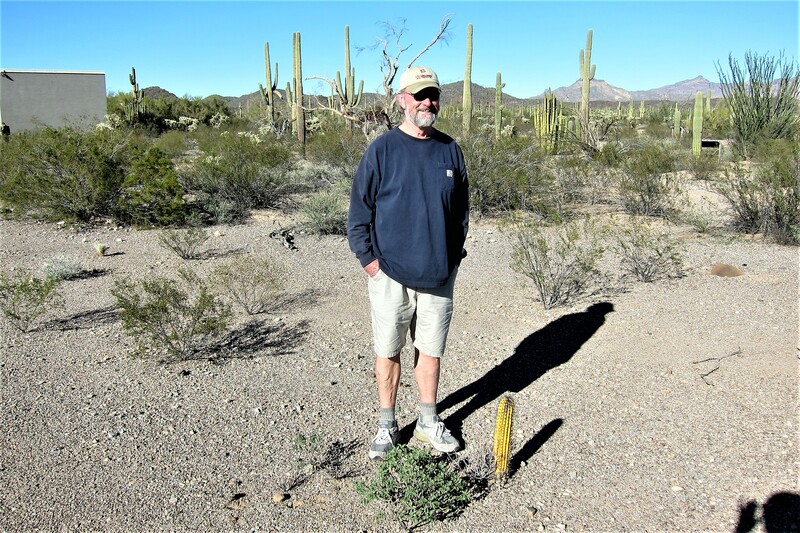 We have just contacted some friends that winter over on BLM land north of Yuma, Arizona and arranged to meet them for lunch. So, with excited anticipation we headed north on highway AZ-85. 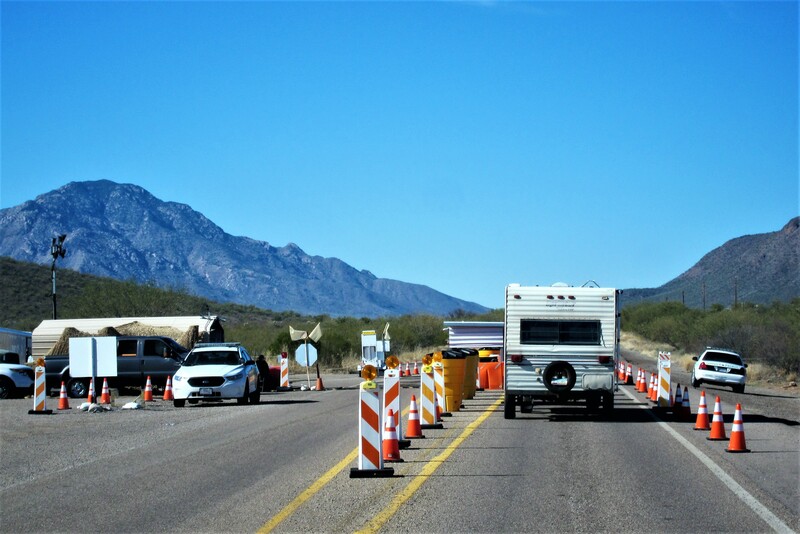 Kit and I were only on the road for a few minutes, when we encountered a pop-up Border Patrol Checkpoint. Exchanging pleasantries with the agents, and successfully answering the same basic questions asked of all travelers, we were waved through. But before accelerating, I thanked the agents for their service…I’ve decided this is something I’ll do from now on when passing through a checkpoint. The agents seemed surprised and happy that there are some Americans that appreciate what they do. 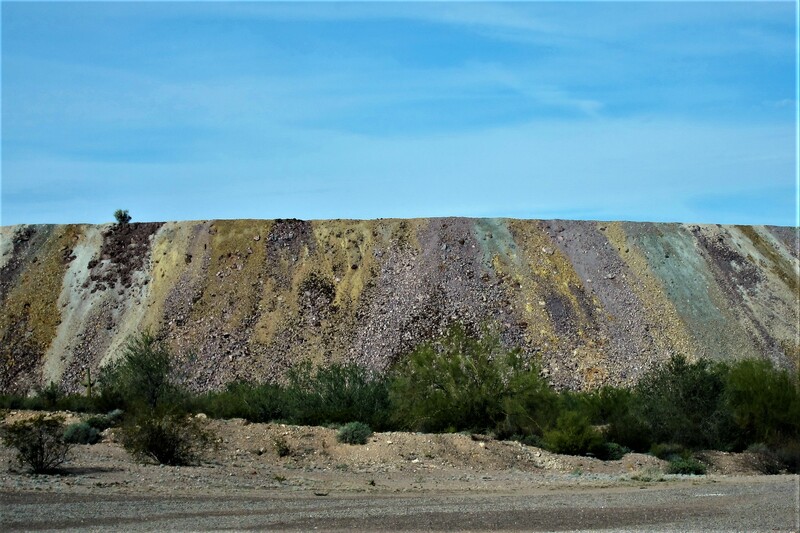 Just south of Ajo, we encountered remains of the New Cornelia Mine, the first mine to discover copper in Arizona. Delivering hundreds of tons of high grade copper, the yield eventually dwindled and the poorly producing open pit mine was shut down in 1985 when union miners went on strike. However, the Tailing Pile remains as an environmental testament to early mining technology. The colors are a result of the various minerals that have been released from the earth during the mining process. You may notice some green streaks in the pile…that is from copper particles that were too small to economically capture. 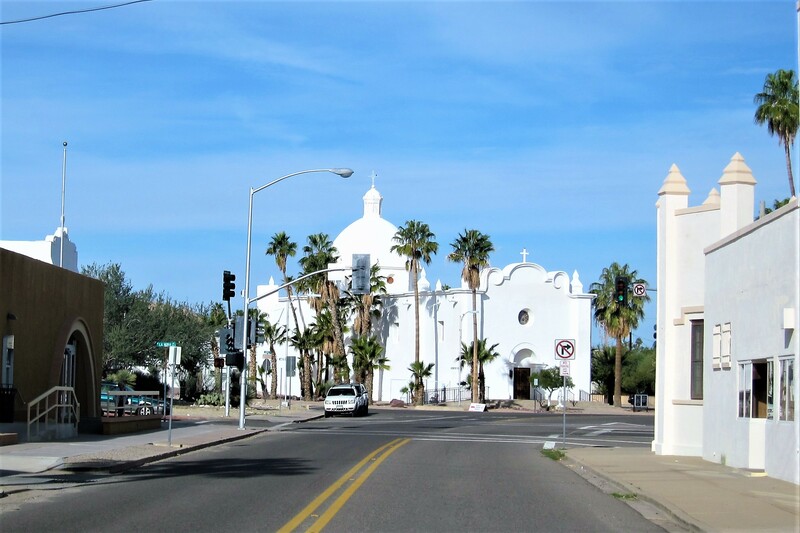 The town of Ajo still survives and has showcased the wealth of its glorious mining past by restoring many ornate buildings that were built with copper mining dollars. 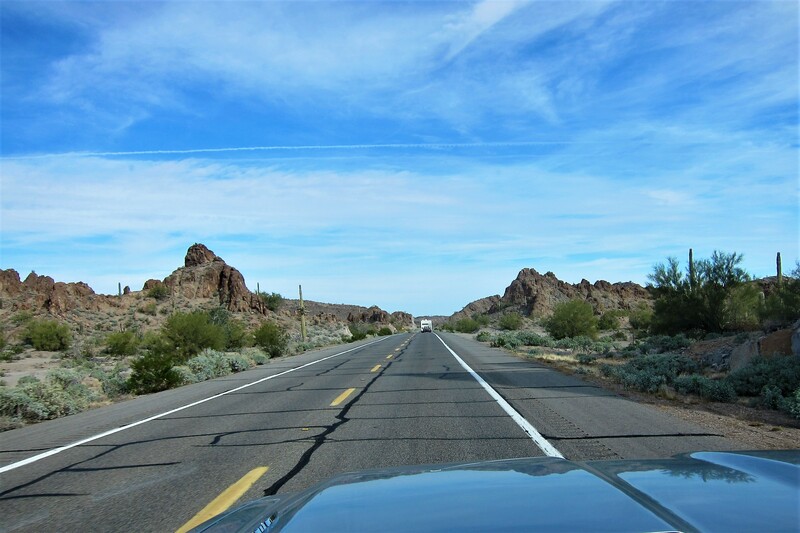 Just north of Ajo lies Gila Bend and our access point to Interstate 10. 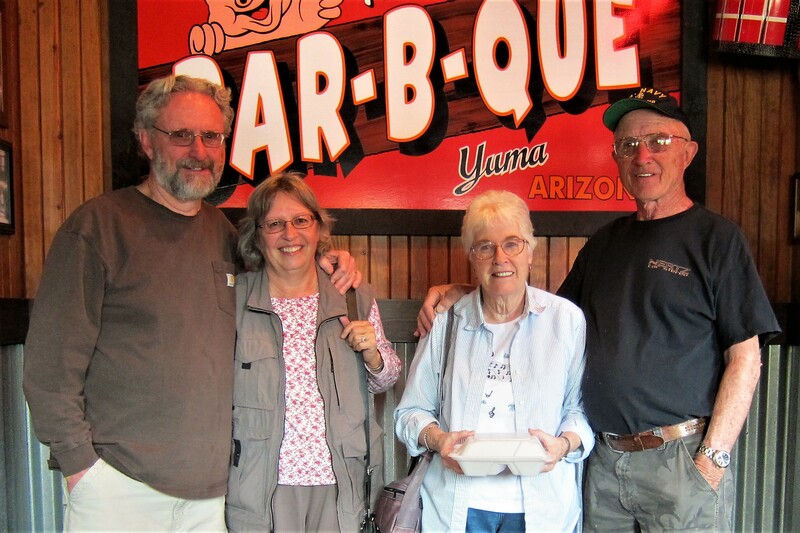 Heading west, we soon rolled into the town of Yuma and found our way to Famous Dave’s Barbeque to meet up with John Roger and Karen. Kit and I had a great time visiting and getting caught up on the news of our lives. And, as a bonus, the brisket was plentiful and very good! After a few hours, it was time for us to hit the road, and for John and Karen to return to their camper up on Snowbird Mesa. Till next time folks, thanks for making time for us, stay well and travel safe! Back on I-10 heading west, we crossed into California at 1504, and promptly gained an hour thanks to Pacific Standard Time. At 1620, we came upon the town of El Centro, and wound our way northwest to the El Centro Naval Air Facility, where we scored a campsite for the next few days. Learned of some quirky places to explore in the area, and Kit is obsessed with finding the huge rotating kiddie barrel from our early family travel days…stay tuned for those stories, and more, in the next issue of Bill and Kit’s Excellent Adventure! 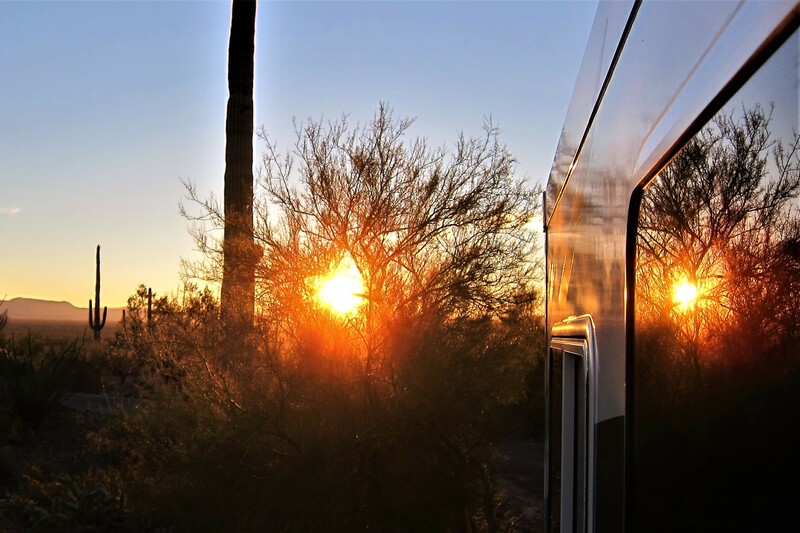 Kit’s Bit’s: Once again, our stay at Organ Pipe Cactus NM was awesome! This park is so beautiful and serene plus, the hiking opportunities are abundant. The park seems to attract a wide variety of campers from all over the US. We’ve seen the smallest tents to the largest motorhomes! Also, we thoroughly enjoyed our short visit with John Roger and Karen in Yuma. We always enjoy their company. We’re trying to get used to having a new “family member” along for the ride. Since Bill is the one who acquired it, how come I continually “remind” him to take it out for some fresh air??? It resides behind his Lazy Boy recliner and needs more attention. We are NOT good candidates for having a pet…sorry, folks…we are working on it, though. 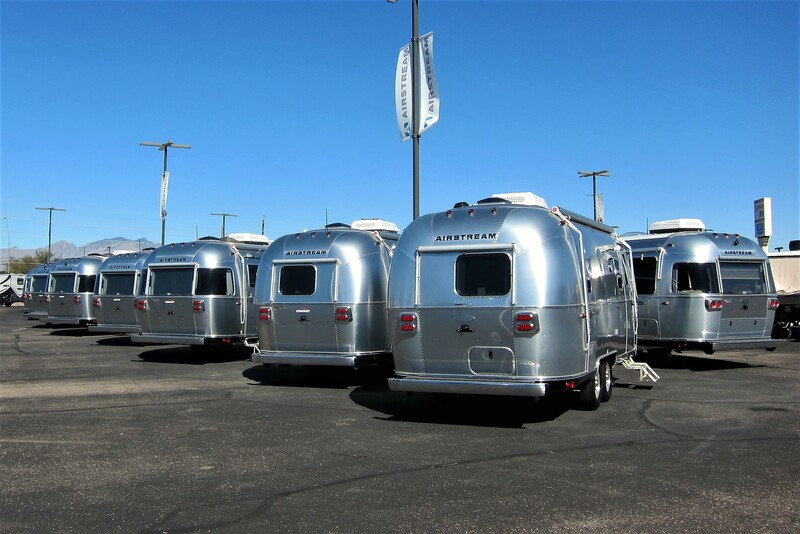 Oh, and I’m still dreaming of one day owning an Airstream! This entry was posted in 2013 Excellent Adventure, 2017 Excellent Adventure. Bookmark the permalink. Don’t know why, but couldn’t open the picture of Dewey’s bullwhip!?????! Dew’s bullwhip….Great job! He should make those and sell them if he doesn’t already! 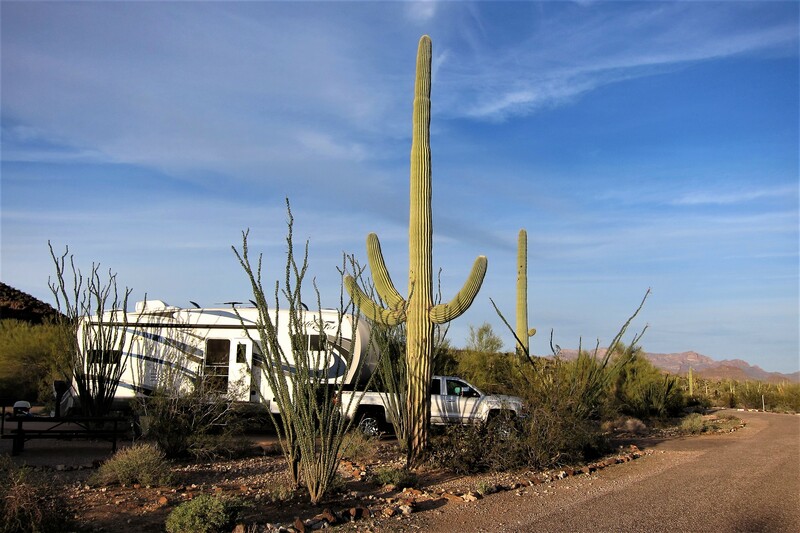 …Agave Gulch RV Park is an incredible park. I could actually live there year-round….One of my favorite planes you saw at the Pima museum is that little “bumblebee” biplane! I’ve been in a biplane before and loved it.. The Organ Pipe Cactus Nat’l Park was so interesting also. On my bucket list now! I had a LOL moment with the pics of what I thought was a large cactus but was not that at all! ….When I think you can’t possibly capture a better sunset…wow…you do! Loved this special sunset with the silhouettes of cacti in foreground! ….Very educational information on the border patrol. Bill, you are a natural investigative journalist… my made up term for sure but accurate… Another career? … I bet the border control agents really appreciated your kind remarks. Bet they don’t get those kind comments very often! Very classy on my book…. Think’s for your very kind comments, and taking time to leave them. Of all the words left on our website, yours are some of my favorites! Take care of yourself…hope to connect with you this summer! You need a Dewey bullwhip to practice your “cracks!” Hee, hee… We were hit hard with snow these past couple weeks. Now, today, President’s Day (A really, really YUGE day for President Trump) it’s in the high 40’s. Washed the ol beater truck. Vicky and I picked up a new Pacifica touring Saturday. Just seemed like the right thing to do. Maybe I fell for all the commercials showing a “caring” dad? We’ll be popping down to FL for a couple weeks next month. We have to journey out west again, mix it with a extended fly fishing or antelope hunting trip. Like that MacBook Pro Kit…. You have good taste in computers! I’d be smiling too. Take care both…. Now, that’s a funny crack! I’m guessing you folks are either basking in the Florida sunshine or about to…enjoy! Okay, Kathy——how about the Tortoise story next time? Sunset and sunrise photos awesome! Have you named the your cactus yet—-how about Cathy Cactus? LOL. Kathy will tell the story, with agitated inflection, at some point when we visit you folks. She did name the cactus, who by the way is enjoying the San Diego sunshine, but not sure it’s suitable for publication on a family website…if you know what I mean?! WOW, WHAT A GREAT SONORA SUNSET PICTURE, RIVALS THE KATAHDIN PIC I SENT ALONG THE OTHER DAY!! GREAT DAY HERE, BRIGHT SUN 45 DEGREES IN THE SUN AND THE SNOW PACK IS MELTING QUICKLY. WE’RE HAVING DINNER AT THE TUSCAN BISTRO A WEEK FROM TOMORROW TO CELEBRATE TWO BDAYS WITH WINDY AND NAN! Happy Belated Birthday! My milestone day is coming up in a few weeks…nothing special planned but who knows! We so enjoyed our bit of time with you two….amazing we both landed in the parking lot at the same time! Are we good or what? Great Meal, and great company! We look forward to every one of your postings…always great entertainment for us. And comparing notes on various things in our identical 5th wheels is always fun too. Travel safe wherever you go….keep on having fun. 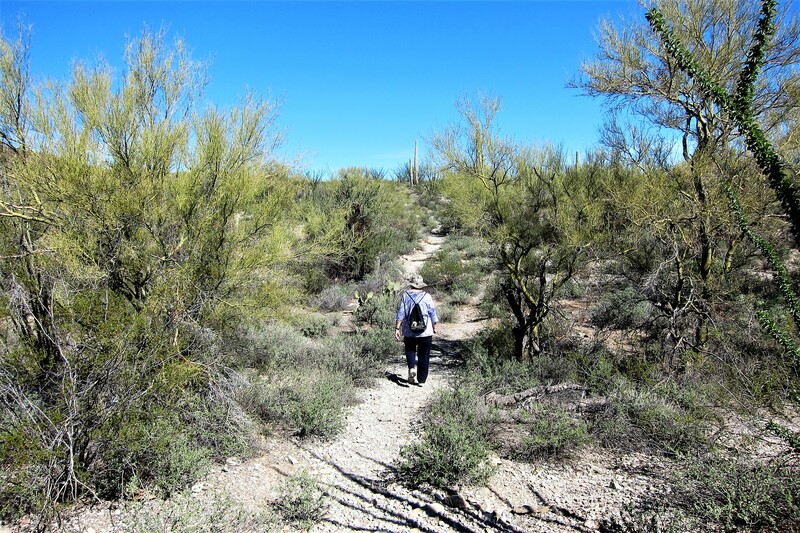 We pull out March 10 enroute to Casa Grande, Pearce (south of Tombstone) for a few days…hope to climb up to Cochise’ Stronghold…and perhaps take a trail down through the Chiracahua National Monument as well. check out some parks in Utah again, then back to Yuma…there is a wedding we don’t want to miss on April 2! A nice couple from church….no relative of ours. Have a great trip…. We had a very enjoyable time visiting with you folks as well. By my estimate you must be on the road following your own adventure…stay well and travel safe! What a gorgeous sunset. Think it beats our Key West sunsets. Not sure about that…you post some incredible sunsets as well. I’m guessing you’re getting ready to head north…hope you enjoy the trip and have a safe and trouble free trip! See you this summer! My secret! One can absolutely not take a bad picture of a rising or setting sun. Hi folks, great to hear from you! I’m betting that by now, the spring season is on the horizon! Kit and I hope to be back in Maine by June 1st…hope to see you folks at some point this summer!